Wreaths are a fun and easy way to put your personality on display for everyone to see. It’s easy to buy something that’s already put together, but it’s so much more fun and personal to create your own. I personally love DIY, I just haven’t had as much time lately with a super mobile eight-month-old baby; however, I put these together in a matter of minutes! The beauty of these DIY wreaths are that you can change the florals with the season so you can keep these up year-round! *Note: protect your door displays by using under a covered porch, on the inside of your door, or between your screen door. I fell in love with our first wreath more and more as I added in different elements. The base is an 18” grapevine wreath. I added two teastain hydrangea bushes and a burlap bow with some fun curly q’s. At first, I thought that was enough and it looked great, but when I stood back I thought it needed more! Wreaths have that big open space that begs to be filled. So, enter the moss-covered birdhouse. The yellow of the teastained hydrangeas, the greenery in the wreath, and the birdhouse add a great pop of color! 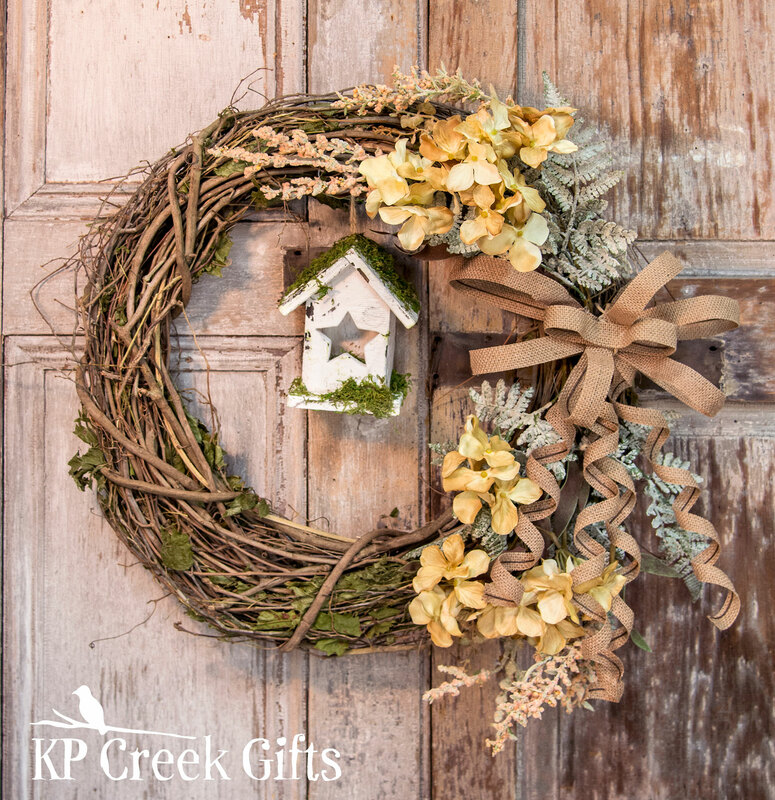 If primitive is more your style, this wreath needs to be your next DIY project. I used the same 18” grapevine wreath as above. 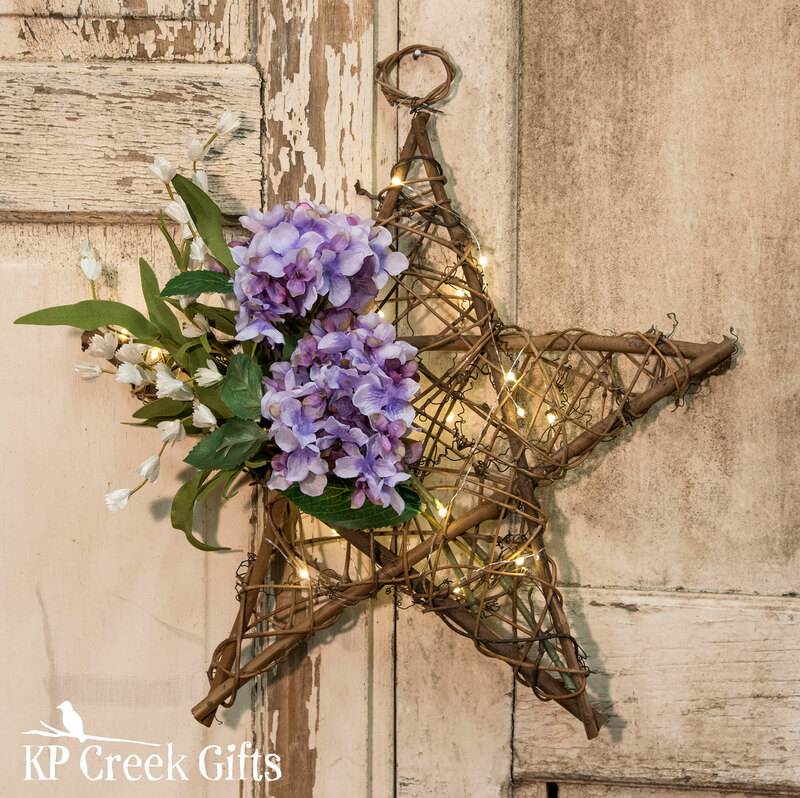 I love stars, so I was happy to use the star double wreath holder that features a distressed star, and the 12” black barn star! To add some warmth and accents, I incorporated four burgundy and gold picks. 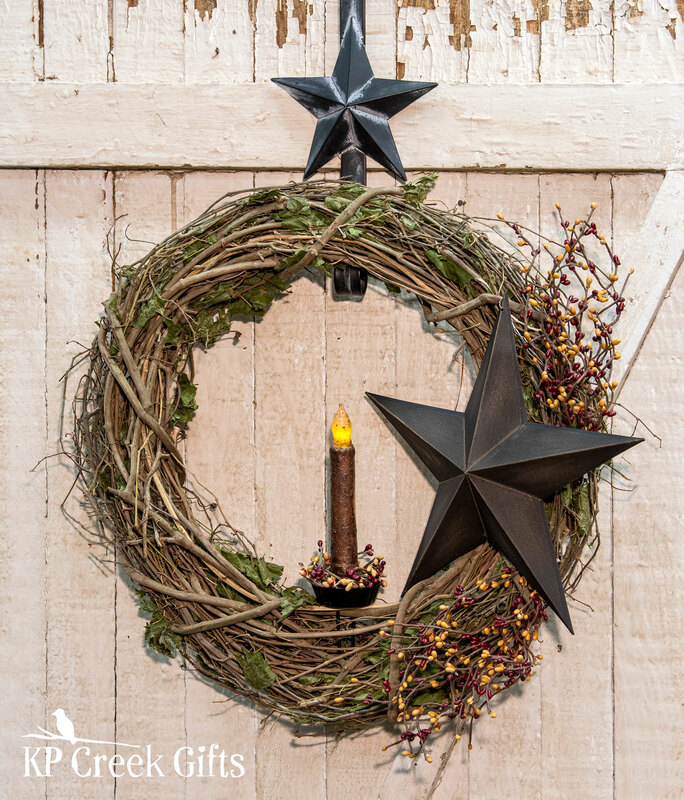 The cinnamon taper gives the wreath a welcoming, soft glow. The taper is nestled in a burgundy and gold pip ring and both of those pieces are in a fluted taper pick that is held in place by the wreath branches. I mentioned how I love stars, so you can imagine how much I adore this arrangement! It was fun to go a little out-of-the-box because I didn’t go with a traditional wreath. I used the 16” twig mesh star, and honestly I could be happy hanging this “as-is.” But pizzazz-ing it up made it even more gorgeous! If I was a cartoon, little hearts would be floating above my head and flashing in my eyes! The florals are two lilac hydrangea picks and one cream lily of the valley. The lilac color is eye-catching and fun; it brings an instant smile to my face and it will do the same for you and your guests. What is a star without a little twinkle? Weaving our LED bud lights was the best decision I made all day. The lights are battery-operated, and the battery pack is pretty small, so it was easy to tuck and secure it in the branches. Which arrangement is your favorite? The Shabby Chic, Primitive, or Country Star? Let us know in the comments! I like the country star one! I think the lights make the look – and it’s the least expensive option! Thanks Mariah! I totally agree about the lights!! Thank you for your comment! Shabby chic is a total favorite for a lot of people! Yes i like the shabby chic one. It really is adorable. Thank you! The yellow color makes me smile! Such a great pop of color. All three styles are great but my favorite is Shabby Chic Wreath. Thanks Carol! It is hard to choose a favorite! The Shabby Chic Wreath is my all-time fav! Would love this on my front door. 😀 Thank you for sharing this! I’m in love with the Shabby Chic Wreath! Thanks Christy! The yellow of the teastain makes me smile! Thanks Dora! Hope you get a chance to create it for your home!